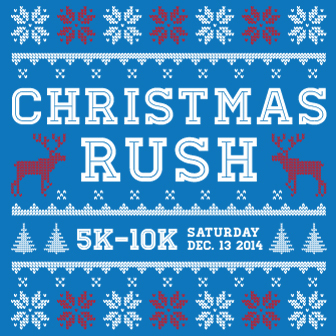 For 32 years the Christmas Rush Fun Run and Walk has been a holiday tradition in Kent. The event features a 10k run and 5k run/walk. The 10k is a flat loop the circles the Kent valley on the Green River Trail. The 5k is a modified out and back that is perfect for those going for a best time or weekend runners and walkers simply out to have a morning run. The course is certified and chip timed with disposable chips. We have a good time and try to focus on the right details to make sure you have a good experience. We have early packet pick up at Road Runner Sports at Kent Station on Wednesday, December 10th from 3:00 to 7:00 p.m. You may pick up for friends. If you miss it, you may pick up your packet on the day of the race starting at 8:00 a.m. The 10k starts at 9:50 a.m. and the 5k starts at 10:00 a.m. Awards are 5 deep. Kids age 13 and under run for just $5! Additional fee's apply if adding a shirt.